Outfit your home living room with this traditionally designed kick skirt upholstered armchair. The chair features low rolled arms, a button tufted seat back and body welts. 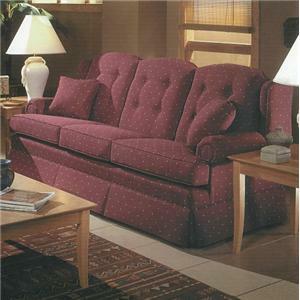 Seat cushions feature high density foam padding and a Comfort Coil spring mechanism. Select from multiple fabrics for an upholstery type that suits your individual taste. The 9800 Traditional Upholstered Armchair by Lancer at Wayside Furniture in the Akron, Cleveland, Canton, Medina, Youngstown, Ohio area. Product availability may vary. Contact us for the most current availability on this product. Fabric Options All fabrics made in USA local to manufacturer. Available in a multitude of fabrics and finishes to accommodate any taste. Frame Construction Frames are inner-locked and glued with corner blocks and feature screw-in legs with center leg for additional support. Seat Support Comfort Coil Spring Construction. Both seat and back springs meet or exceed the industry standards. Each coil is produced of high-carbon spring wire and tempered to provide long lasting durability. Each unit has 9-gauge high-carbon, tempered wire support system to which the coils are attached on the bottom. The series of coils are attached to each other on top by a custom made plastic link and spring wire lace system. The outer perimeter of the coil unit is secured by a 6-gauge border wire. This forms a unitized seating surface. Crafted from oven-tempered wire for added strength and durability. Regalflex D.I. is a proven, high quality coil spring seating construction. Padding & Ergonomics Seats use high-density foam cushioning. Its ability to retain the majority of its original shape and comfort is better than most foam cushioning available today. Warranty Warranty for foam cushion cores for five years in its original fabric to the original owner. Warranty for upholstery fabrics for one year against wear and seam opening under normal care and use. Browse other items in the 9800 collection from Wayside Furniture in the Akron, Cleveland, Canton, Medina, Youngstown, Ohio area.